California is in the middle of a nearly unprecedented period of change in the state’s education system. Following voter approval of Proposition 30 in 2012, the Legislature adopted the Local Control Funding Formula (LCFF) in 2013. The LCFF upended the way California funds schools, redistributing revenues toward schools and school districts facing the greatest challenges and shifting control over the allocation of revenues from Sacramento to local educators and their communities. The decentralization of authority and responsibility brought about by the LCFF is reflected in the state’s new accountability system. The centerpiece of the new system is the Local Control Accountability Plan (LCAP), which must be developed in consultation with parents, teachers, and the broader community. The LCAP ties decisions about the use of resources directly to local strategies for educational improvement, rather than focusing on student test scores as the sole or even primary criterion for educational performance. Along with radically new school finance and accountability policies California is simultaneously moving forward with the most ambitious transformation of standards and assessments in a generation. The Common Core State Standards (CCSS) and the associated Smarter Balanced Assessment Consortium (SBAC) assessments promise greatly improved instruction and deeper learning for all California students, but successful implementation of the new standards will require major changes in curricula, instructional materials, teacher training, and professional development, among many other things. The courts have also weighed in on education policy issues in California. The recent decision in the Vergara v. State of California case would require the state to rethink state and local policies on several key elements of teacher employment policy including “teacher tenure” and the rules for teacher dismissal. How much do California voters know about the policy changes that are transforming their education system, and what are their views about the direction in which the state is moving? 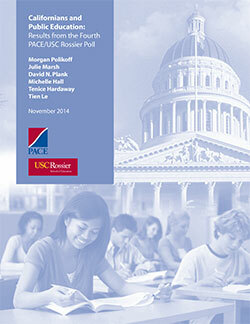 In this report we present findings from the latest Policy Analysis for California Education (PACE) and University of Southern California (USC) Rossier School of Education poll. The poll was conducted by MFour Research/Tulchin Research in June 2014. It surveyed California voters’ knowledge and opinions about the quality of the state education system, CCSS, the Vergara case and teacher employment policies, LCFF, and charter schools.